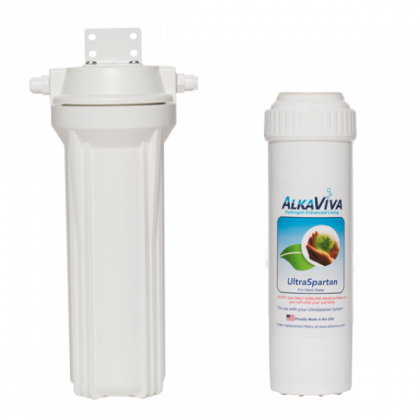 The Ultra Spartan Shield provides you with the highest quality and greatest tasting water in areas where your water is excessively hard and a home water softener is required. (Not sure what the water is like in your area? 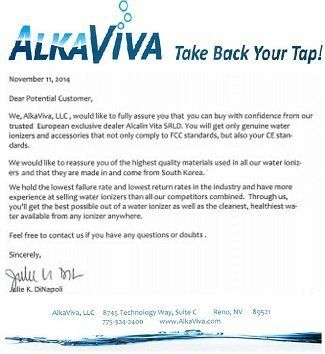 Check our water hardness map) At the same time you are protecting your investment in your water ionizer/ H2 generator. The Spartan hard water ionizer filter is a unique, proprietary combination of 7 stages of filtering, designed to work in areas of poor water quality. This home water softener is rated for 1000 gallons. Water quality varies greatly from place to place, often within the same city or geographical area. There is no one-size-fits-all water product. Any ionizer, H2 generator or water product, will perform differently and have a different expected lifespan in soft, average or hard water situations. The cleaning systems on all ionizers are designed to clean only the electrodes inside your water cell. In hard water areas, the Ultra Spartan hard water filter helps to protect the other parts of your ionizer or H2 generator, such as hoses and valves, that are still open to damaging scale buildup. The Ultra Spartan water ionizer filter offers you: a solution in areas where your potable water is too hard to work well with any water filtration device. This hard water filter will help eliminate virtually all of your drinking water concerns while giving you great tasting and healthy water. The Ultra Spartan hard water ionizer filter can be installed before your ionizer, either above or below your counter. The Ultra Spartan’s hard water filtration system consists of the filter, an inline external housing (that houses the filter), a filter housing wrench and tubing. The quick connect fittings make this water ionizer filter a snap to install. The Ultra Spartan hard water filter overcomes the downsides of traditional Reverse Osmosis systems by offering a great flow rate, having no tank pressure to maintain and doing all this without creating a drop of waste water. The effective life is entirely dependent on the qualities found in your source water. Simply put, the more particles in your water, the more quickly the media will expire – just like any filter or media. Because water quality and personal preference varies, timely replacement of this cartridge is up to the individual. 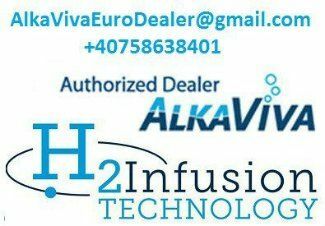 This hard water ionizer filter can last from one month to one year. Let’s look at the Ultra Spartan filter for hard water and how many stages, or barriers to contamination, it offers. Stage 2: Then, we add a stage of KDF 85, which addresses concerns for iron, hydrogen sulfides, and manganese contamination. It also helps reduce chlorine and chloramine. This stage also conditions the water in two important ways. It changes the scaling calcium into a non-scaling form that helps protect your ionizer and it optimizes the pH into the range that increases effectiveness of the next media in removing fluoride. Stage 4: We now add a stage of high grade carbon that is very effective at reducing chlorine, VOCs, disinfectant byproducts such as trihalomethane and also improves water taste and clarity. Stage 5: Is a 1-micron barrier. Stage 6: A special mix of NSF certified, anti-scale, media is added to help prevent nuisance metals in the water supply (iron, manganese, calcium, magnesium) from sticking to surfaces. This mix can also improve the quality of water in the distribution system by removing existing scale deposits plus discourages microbial film formation/regrowth. Stage 7: The last stage is another 1-micron barrier.